Town Center at Beach Cove Resort: Now Open! The brand new Town Center at Beach Cove Resort is now open and ready for your family to enjoy! The oceanfront Town Center was designed with family members of all ages in mind. This multipurpose lounge and recreation center has everything from food, drinks, games and more and is sure to be your family's new favorite hangout spot when staying at Beach Cove. Hungry but don't have time to sit down and enjoy a big breakfast? 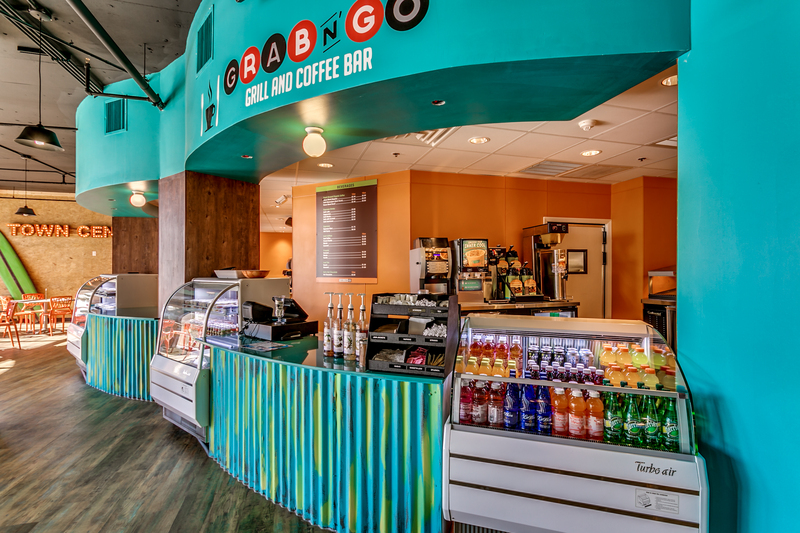 Grab N' Go is the perfect place for a cup of coffee to go and a quick bite to eat before heading out for the day. Grab N' Go offers a selection of freshly brewed coffee and lattes, juice, breakfast wraps, muffins, yogurt parfaits, fresh fruit, and more. Kids and adults alike will enjoy the brand new arcade games in Winner's Circle. The state of the art game room features familiar games you might remember from your childhood as well as exciting new games that everyone will be sure to love. The best part is that each game is cashless meaning no need to scrounge for quarters. You simply load your game card to play any or all the games in the arcade. The points you win during your games will be loaded back to your card so you can easily redeem them at the Winner's Circle for all sorts of cool prizes. Located in the middle of the Town Center, Tipsy Turtle Beach Bar is a great spot to relax after a long day on the beach. Enjoy the beautiful ocean views while sipping on your favorite adult beverage or non-alcoholic, frozen treat for the kids. Tipsy Turtle offers a wide variety of appetizers, paninis, wraps, pizza, and more which is ideal for a quick lunch in between the pool and the beach or a casual dinner without having to leave the resort. For your convenience, the oceanfront Town Center is located adjacent to the lobby and is open daily from 7am until midnight (hours may vary based on season). Whether you're just starting your day at the Grab N' Go or ending your night with an after-dinner drink at the Tipsy Turtle, the Town Center has got you covered. Excited to check it out? Don't wait, book your next trip to Beach Cove today!